From professional tooth whitening to porcelain veneers, Pear Tree Dental will make sure you have a smile worth showing off! Contact us for an appointment. At Pear Tree Dental we offer a unique WHITENING FOR LIFE program where you pay a one­ time fee of $199 and receive custom fitted whitening trays along with top of the line whitening gel to get that perfect smile. You then receive FREE touch up gel every 6 months when you come to your cleaning appointments. 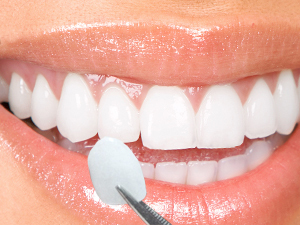 We also offer in-office Zoom whitening, for dramatic results in just one office visit. Are you uncomfortable with the way your teeth look and try to avoid smiling whenever you can? Do unsightly gaps, chipped, broken or crowded teeth or discolored spots tend to make you cover you mouth and hide your smile? Imagine what it would be like to have an ideal smile with straight, strong bright teeth. This is possible with porcelain veneers and porcelain crowns. In as little as two visits, we can create a beautiful new smile that will allow you to radiate joy, excitement and vitality. An aesthetic evaluation and consultation will allow us to show you what a new smile can do to brighten your life.